Posted on Wed, Feb 22, 2012 : 12:45 p.m.
Thirty-eight horses died Tuesday night in a barn fire in Grass Lake Township, the Jackson Citizen Patriot reported. A fire killed 38 horses and destroyed a barn at Campbell Stables horse farm in Grass Lake Township Tuesday night. 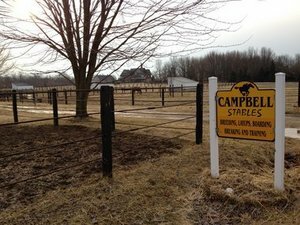 An employee at the Campbell Stables horse farm was taken to the University of Michigan Medical Center in Ann Arbor, suffering from burns to his hands and legs. The fire, which broke out shortly after 10 p.m., destroyed the barn, the Citizen Patriot reported. Flames from the fire shot 100 feet into the air, witnesses said. The cause of the fire had not been determined, but it’s not suspicious, Grass Lake Township Fire Chief Greg Jones told the Citizen Patriot. Grass Lake Township is just west of Washtenaw County. Read the Jackson Citizen Patriot article. Wed, Feb 22, 2012 : 9:01 p.m.
How sad. I hope the employee recovers. Wed, Feb 22, 2012 : 7:20 p.m. This is just a terrible tragedy. I believe some responders from Washtenaw County also went there. Fire has always been a great fear for those with barns,especially when those barns contain animals. I feel so sad for the horses and the employee that was burned in the fire. Wed, Feb 22, 2012 : 5:59 p.m. Awful, just awful, those poor animals.. I hope the employee is ok, they must have emotional wounds in addition to their physical problems.